Nominated for Best Animated Feature Film (Peter Lord). The Pirates! Band of Misfits is like a bad Saturday cartoon, only with much better animation. I couldn’t sit still through the film and kept my eye on the clock, which is worse than watching water boil because the film was an hour and a half long. When your favourite part of the film is the end credits, there is something significantly wrong with the story. 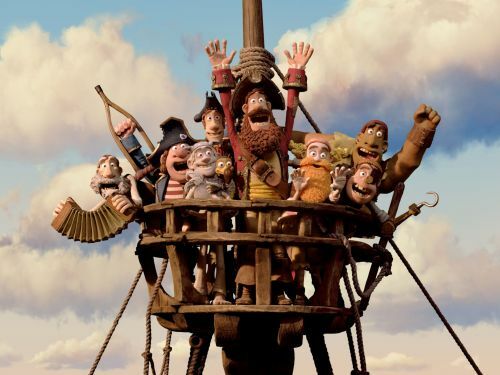 The Pirate Captain (voiced by Hugh Jackman) has been trying for years to win the Pirate of the Year award, and has lost every time. It’s not hard to see why when his competitors fly in on waves of booty with excessive Pirate pizzaz. Although his crew of misfits–albinos and “surprisingly curvaceous” pirates among them–stand behind him wholeheartedly, their luck never seems to come, until they ironically discover Charles Darwin out at sea. He excitedly points out that their parrot is actually an “extinct” Dodo bird and talks them into going to London to win an award for scientific discovery. Although Queen Victoria is a well known pirate hater, The Pirate Captain can’t see reason and thus makes the trip to London, crew in tow. All is well and good, with good laughs and all, until around this portion of the film, where everything seems to get confused and I got lost among the plot points that began sprouting out of nowhere. The plot kept going and going–circling back in on itself and exploring areas that had already been revealed and discussed. The bad guy keeps resurfacing, the good guy somehow always fails miserably until the opportune moment, and you’re never quite sure how many movies you are watching–be it one or seven. By the end of this film, I wanted to rip my eyeballs out… or run around the block a couple times to get my impatience out. While the claymation was great, the redeeming qualities were few and the film as a whole was absolutely terrible. Despite all of this, I ended up watching almost the entire end credit sequence because it tied all of the plot lines together in minute shorts that were more funny than the rest of the movie put together. There were hilarious supporting characters voiced by even more amazing actors. The Aardmans have such an incredible reputation for producing some amazing claymation stop-animation films with hilarious stories and wonderful charters, but unfortunately I found much to be desired in this film and am not surprised that the film fell short of an Academy win. Personally, I would not recommend this film. However, your kids might like it, and I have read several reviews in which adults quite enjoyed the film as well. Perhaps my patience with meandering stories has been frayed lately, but I doubt I will ever watch The Pirates! Band of Misfits again.